This piece will present street musicians, interviews, conversations and street noises in a different time and space to change and augment the auditory experience. Hanging from the rafters of the recreational center and behind the bushes near the benches, I will install small speakers that have a minimal visual component as to not distract from the sounds themselves. I will need microphones and a digital audio workspace to record, arrange and master these sounds into a couple loops that will last 10 minutes each. This installation would happen in various parts of Columbus Park in Chinatown. The installation would start at the rec center at the north end of the park with speakers hung from the rafters. Then, speakers would be hidden in bushes behind benches near the basketball court. Both of these spaces provide very different acoustics and in turn a different experience. Sound based installations and public art has not been around very long. It is a relatively recent idea to use sounds to sculpt an audience experience. The timeline for sound art is muddy because our confusingly broad definition for what qualifies as sound and what qualifies as music. 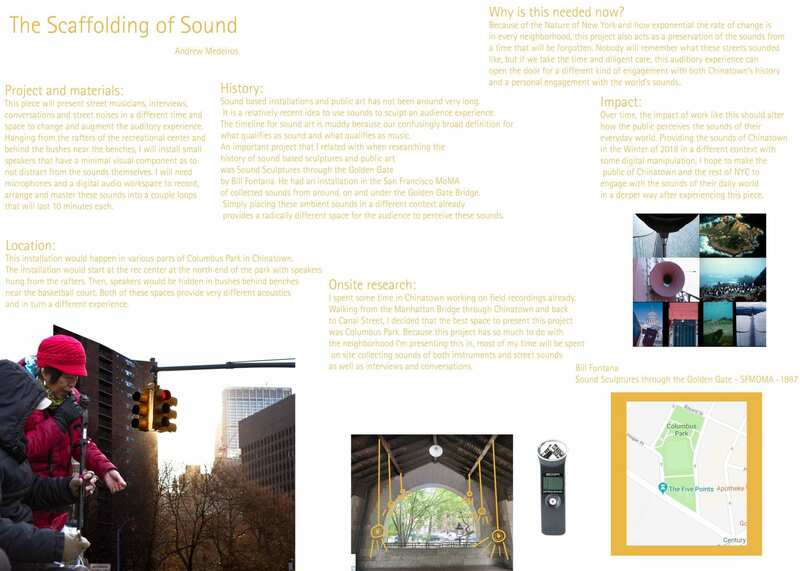 An important project that I related with when researching the history of sound based sculptures and public art was Sound Sculptures through the Golden Gate by Bill Fontana. He had an installation in the San Francisco MoMA of collected sounds from around, on and under the Golden Gate Bridge. Simply placing these ambient sounds in a different context already provides a radically different space for the audience to perceive these sounds. I spent some time in Chinatown working on field recordings already. Walking from the Manhattan Bridge through Chinatown and back to Canal Street, I decided that the best space to present this project was Columbus Park. Because this project has so much to do with the neighborhood I’m presenting this in, most of my time will be spent on site collecting sounds of both instruments and street sounds as well as interviews and conversations. 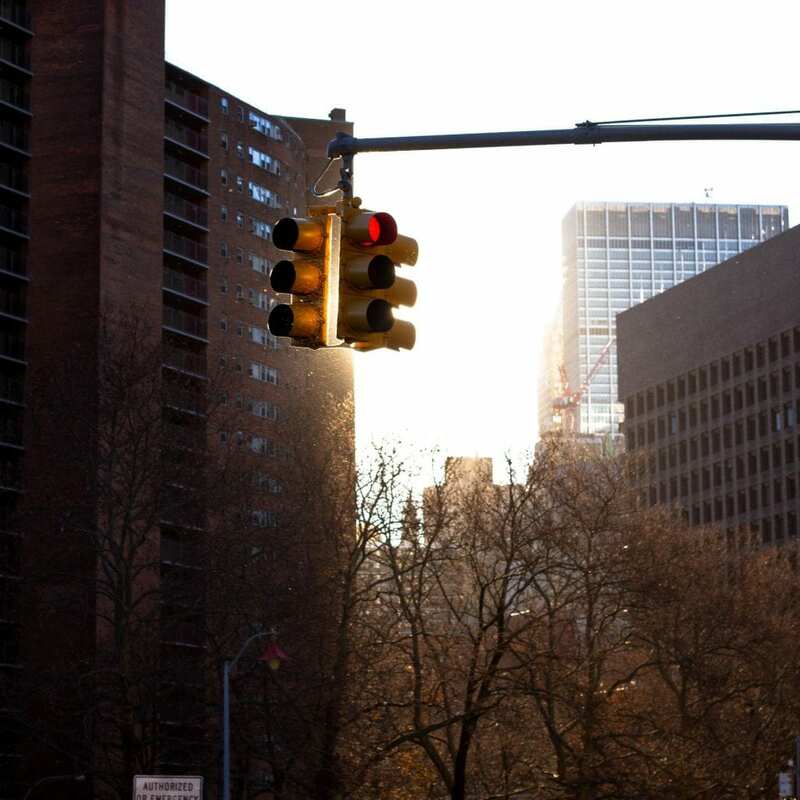 Because of the Nature of New York and how exponential the rate of change is in every neighborhood, this project also acts as a preservation of the sounds from a time that will be forgotten. Nobody will remember what these streets sounded like, but if we take the time and dilligent care, this auditory experience can open the door for a different kind of engagement with both Chinatown’s history and a personal engagement with the world’s sounds..
Over time, the impact of work like this should alter how the public perceives the sounds of their everyday world. Providing the sounds of Chinatown in the Winter of 2018 in a different context with some digital manipulation, I hope to make the public of Chinatown and the rest of NYC to engage with the sounds of their daily world in a deeper way after experiencing this piece. If this piece was actually built, I think the neighborhood would not immediately have a positive reaction. Over time, I think the piece would age well. As the years pass, the sounds of the neighborhood will change. Once the nature of the sounds surrounding the sculpture changes, they become a relic of time. While designing this project, I realized I am capable of writing proposals. I didn’t think I would be able to get into this kind of writing or art making. It was important to me to step out of my usual art world and into a different one. To build a good proposal, I need to take time to explore creatively and find an idea that I can believe in. My final take away is that I have the ability to write proposals and make good work, but I must provide myself with the time to make my best work and revisit my ideas in order to make them into fully fleshed out ideas.